So you've got a vascular system. What comes next? Seeds. Seeds let you send your offspring out into the world. Seeds provide a protective coat so that the embryo plant can develop when it finds a nice piece of soil. But remember this: gymnosperms have not developed the ability to make flowers. Flowers are an evolutionary advancement after seeds. So if you have a vascular system, seeds, and no flowers, what are you? A gymnosperm! Seeds are a protective structure that lets a plant embryo survive for long periods of time before it germinates. Seeds have food sources pre-packaged for plant embryos to provide for an embryo's needs in early growth. Seeds let plants spread their embryos over large areas. Some are even so lightweight that they are carried across the planet by strong winds. Seeds are an advantage if you want to be a plant that can grow anywhere. Seeds are da bom'! Looking like a fern. Looking like a palm tree. It's actually neither! 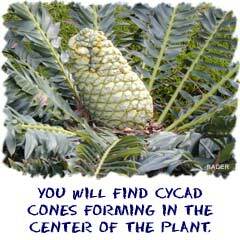 It's a cycad. These are another favorite of landscape designers. These are sturdy little plants that can survive in harsh conditions. You won't find them in cold areas like the conifers. Cycads need warmer weather to survive. They have cone-like structures for reproduction. Instead of being on branches, their cones are in the center of the plant and can get really large. They also have big waxy fronds, and when it's time to reproduce, the female plants have a great fruit that grows in the middle of their stem. Pine, cedar, redwood, and spruce. Sounds like we're at a hardware store buying lumber. Not so. We are listing off a bunch of trees that are called conifers. If you've ever gone skiing or to northern latitudes you have seen loads of conifers. The conifers most people think of are pine trees. Every year millions of trees are grown for Christmas and they are all conifers. 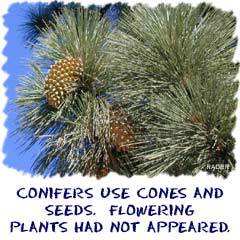 They usually have needles and cones (thus the name CONifer). They are also evergreens: even in cold winter months they are able to keep their needles. That ability is one reason they do so well in northern latitudes. The ever-present needles allow conifers to take advantage of the Sun whenever it is around. They are also some of the tallest plants in the world. They are able to get very tall and strong because of heavy-duty xylem that hardens and makes them sturdy. That sturdiness is why these kinds of trees make good lumber - hard and strong wood. Not every plant made it to the modern day. Fossil evidence shows what plants used to be alive in other geological eras. 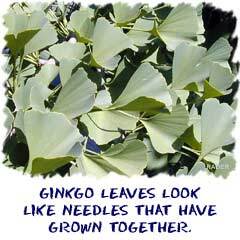 The Ginkgo is one of the ones that made it. Some people call it a "Maidenhair Tree". It's the last one of its kind. It has needles that have combined to form very sturdy leaf-like structures. You need to remember they are not like leaves in the traditional sense. You've probably seen these all over. Landscape designers love to use them because they look very nice and are very resistant to pollution. They are great for cities. Being able to resist insects and disease has let this species survive beyond all of its close relatives.